So you’ve seen the Giant’s Causeway and laid lips on the Blarney Stone. What’s next? 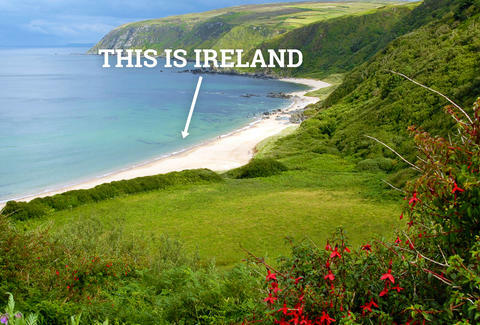 There’s more to Ireland than the greatest hits (though you should definitely check those out), so we’ve put together your alternative guide, from new and lesser known attractions, to odd hotels, and places so far off the beaten path that you just might need the Coast Guard to get back. Belfast’s not pointing fingers, but on the subject of RMS Titanic, “She was fine when she left here” is a bit of a local mantra. 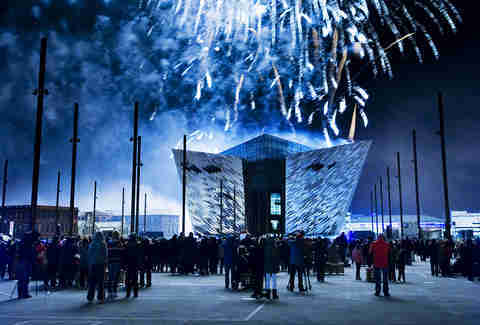 Titanic Belfast opened in 2012 on the site of the former Harland & Wolff shipyard, which built the Titanic, and is the world’s largest visitor attraction dedicated to its ill-fated voyage. Interactive galleries, rides, scale reproductions and exhibits explore exactly what happened, and impart a whole new appreciation for dry land. Note: You won’t find any items from the Titanic wreck, for ethical reasons, but you can check out letters, menus, plans, and artifacts that stayed behind. 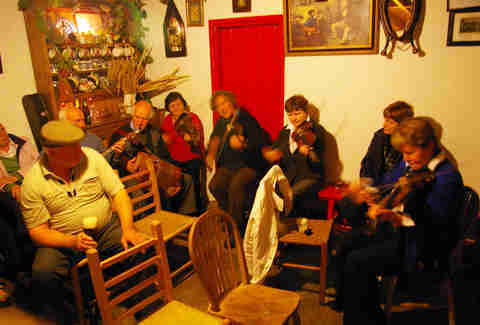 Traditional Irish folk music doesn’t get more underground than at Jim O’ The Mill, a pub that opens only on Thursdays, and isn’t signposted or advertised. Should you negotiate all that, the music starts sometime after 9pm, and is provided by whoever happens to be there, and is feeling up for it. Yes, that means you can also give it a shot. Note: Stay til midnight, when the owners are gracious enough to provide ham sandwiches all round. Gather up to 11 of your closest friends and head 20 miles north of Belfast for a cliff takeover. 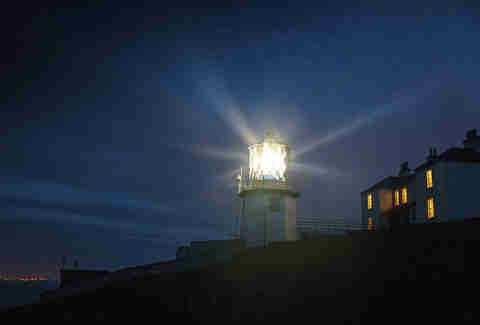 Blackhead Lighthouse consists of two keeper’s houses, which sleep up to five and seven respectively, for a three-night minimum. Each is stuffed with paraphernalia that once saved sailors’ lives and can now get you mad Instagram likes, like the whistle pipe system that woke up the next watch and a tunnel that was used to travel between the lighthouse and living quarters in rough weather. Note: House 1 is cliff-facing, so while children are welcome, they must be supervised at all times. Nature is a wonderful thing, but so are 180-degree transparent plastic walls between you and whatever you’d rather not get too in touch with. 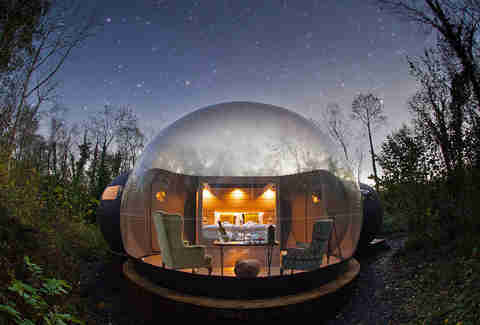 Such is the brilliance of the bubble domes at Finn Lough Resort -- a luxe solution to the camp/don’t camp conundrum that is better than either. Gaze out at the stars from a four-poster bed, safe in the knowledge that those plastic walls are all you need; there are as many bears in Ireland as there are snakes (zero). Note: The en suite bathrooms are considerably more private than the domes themselves. Ever feel that modern infrastructure has sucked all the excitement out of life? 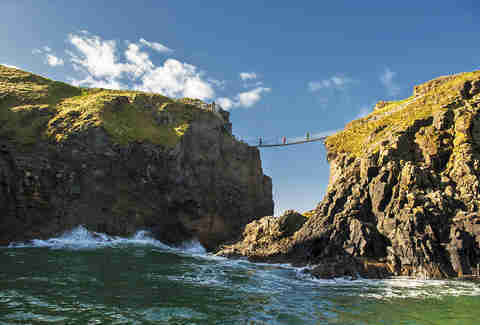 Check out Carrick-a-Rede Rope Bridge, the seriously daredevil 66-foot route between the mainland and the tiny island of Carrickarede. If you think it’s scary now, consider that it was built by a fearless bunch of salmon fisherman some 300+ years ago, somehow. Today’s deluxe version is maintained by the National Trust, and comes complete with two handrails and the reassuring presence of wire. But still, after you. Note: There’s no shame in being too scared to make the return trip -- boat rescues by the Coast Guard are a regular occurrence. 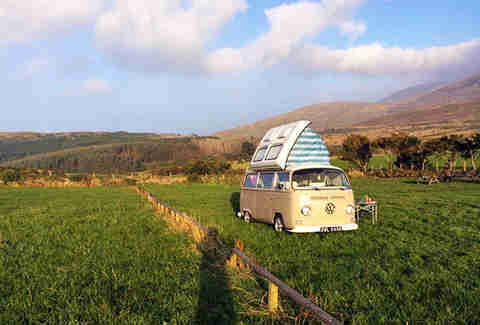 See the country, Scooby Doo-style, with a VW camper van from RentaDonkey. Go retro with Donkey, the 1972 T2, or tear it up in Betty, a modern T5. Every camper comes fully equipped with a gas hob and sink, “rock n roll bed,” iPod compatible sound system, fridge and cool box, and those rental fees include UK insurance and breakdown cover. Note: Pick up is at Lisburn, close to both Belfast airports and Dublin’s. 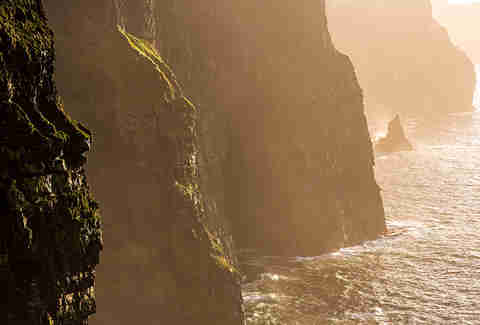 It’s also a prime departure point for cruising the Causeway Coast, Mourne mountains, and Wild Atlantic Way. Usually, staying the night in a bar is a bad thing -- or at least, unplanned. But consider Conroy’s, “The World’s First Self-Catering Pub,” the stuff self-catering dreams, actually just dreams, are made of. 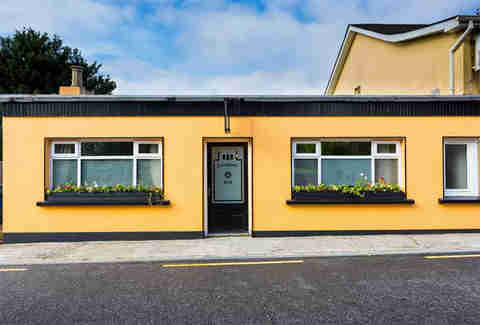 You and up to three friends get the run of a converted Irish village pub, and the AKA, “The Pub With No Beer,” is a misnomer; you can bring your own! Conroy’s may not hold a liquor license anymore, but you wouldn’t guess from the polished mahogany bar, reproduction liquor bottles and pumps, and welcome sign. Note: The owners advise keeping the door locked at all times in case a bachelor party stumbles in, demanding whiskey shots. It has happened. Though travelers often list “meeting people” as a major incentive, curiously, nobody has ever stepped onto a beach and been glad that someone else was there. 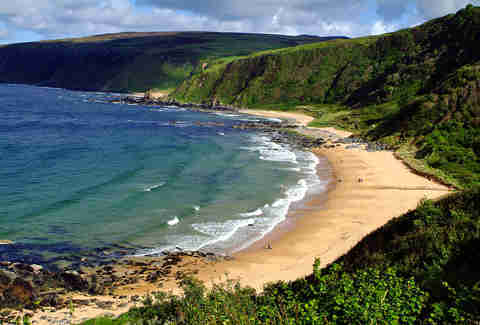 The chances of that are especially slim at Kinnagoe, a suitably isolated, soft, sandy beach in Inishowen Peninsula. Note: If you do run into someone, impress him or her with the knowledge that one of the ships of the Spanish Armada, the Trinidad Valencera, sank off the coast here in 1588. Then tell them to get off your beach. What’s the difference between a plain old barn and a wonderful barn? 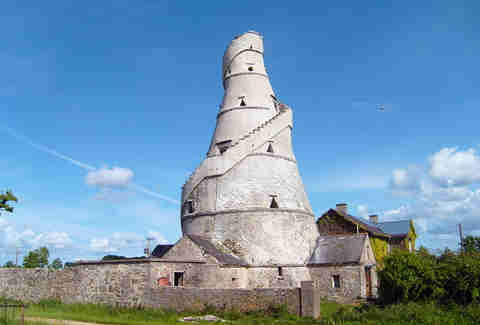 This crazy-looking medieval thing, at the edge of the Castletown estate, is shaped like a giant’s corkscrew, due to the winding staircase around the outside. It also has parapets on the roof. Which is all to say that like a lot of things in Ye Olde Europe, nobody’s 100% sure what it was for -- or if it’s even a “barn” at all. Note: It was built in 1743, maybe just for the hell of it; one theory is that it was part of a public works program at the time to put injured farmers to work. 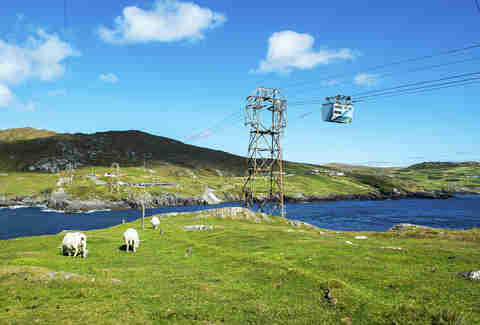 Take Ireland’s only cable car, and Europe’s only cable car that crosses open water, to Dursey Island for bird, whale, and dolphin watching, and obligatory breathtaking scenery. The crossing takes just 6 to 7 minutes, so even your most nervous friend can deal, and departs daily, year-round, from Ballaghboy, at the tip of the Beara Peninsula. The summer schedule is 9am to 8pm. Note: Dursey has only six permanent winter residents, probably because it has no shops, pubs, or restaurants. So note the return schedule or you’ll have to befriend those people. 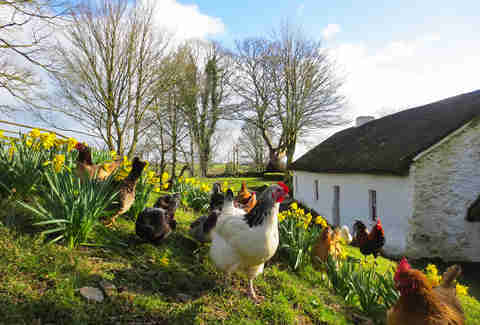 School yourself on three centuries of Irish emigration to America at this open-air museum. Costumed reenactments take visitors from the thatched cottages of Ulster to the Frontier via a full-scale interior of an emigrant ship, and there’s a full roster of events, talks, and lectures on emigrants’ experiences on both sides of the Atlantic. Note: If some of the buildings look legit, it’s because they are. Among the real deals is the pre-1845 Devine family cabin, which was relocated to the park, brick by brick, from Altahoney townland. That “American Street” however? Calm down, there is no gaping hole in the ground stateside; it's a reproduction. Ok, the Cliffs of Moher are hardly going to win you intrepid points, but a different angle is literally possible; see them from the sea! Several ferry companies operate tours out of Doolin, for a neck craning take on this famous 5 mile stretch of perpendicular and overhanging rocks. Note: Among the sights is the filming location for “The Cliffs of Insanity” in The Princess Bride. Game of Thrones has also filmed here (obviously).